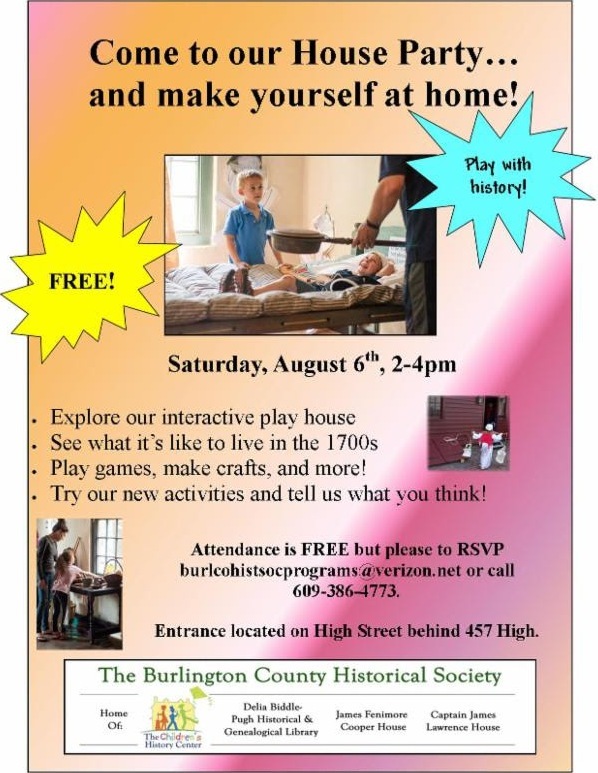 NJ Weekend Historical Happenings: 8/6/16 - 8/7/16 ~ The History Girl! A rare opportunity for members of the public to explore the unique treasures of park's archival and rare book collection. This behind-the-ropes, curator-led tour of the library and archives is a once-a-year-only opportunity to experience the depth and breath of the Morristown collection. In partnership with the Morris County Tourism Bureau, this program will introduce those attending to the wide world of the Morristown NHP Collection. Tour size is limited to 30. Cost: $20.00, which includes admission to the park for the day. Reservations are required. The Washington's Headquarters Museum is located at 30 Washington Place, Morristown, NJ. For reservations, contact the Morris County Tourism Bureau at www.morristourism.org or 973-631-5151. 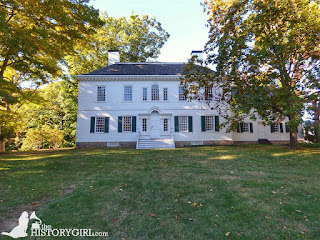 For more information about Morristown National Historical Park, call 973-539-2016 x210 or visit www.nps.gov/morr. Come to the beautiful grounds of the Physick Estate and experience what CBS NY named one of New Jersey's Top Five Summer Festivals! This all-day festival features local craft beers to wash down favorite summer picnic foods such as steamed crabs, crab cakes, steamed shrimp, pulled pork, corn on the cob, potato salad and more. Enjoy live music all day on the outdoor stage. Have fun with jugglers and acrobats, crafts and food vendors, a farmers' market and more. Admission to the grounds is free. There will be a charge for food, beverages, and some activities. Bring home a commemorative pint glass or t-shirt. The festival begins at 11:00 am and ends at 8:00 pm. The Physick Estate is located at 1048 Washington Street, Cape May, NJ. Presented by the Mid-Atlantic Center for the Arts & Humanities (MAC) and sponsored by PNC Bank. For more information, call 609-884-5404 or 800-275-4278 or visit www.capemaymac.org. Proceeds benefit MAC's educational outreach programs. On Saturday at Fosterfields Living Historical Farm, take a horse-drawn wagon ride! With an emphasis on sustainability, this narrated wagon ride explores the methods, equipment, crops, and enterprises of Fosterfields in the early 1900s. You can also make a special Independence Day craft! The tour runs from 10:15 am - 12:00 noon. Preregistration is required. Please call 973-326-7645 to register. From 1:30 - 2:30 pm, try out seasonal activities from The American Boys and Girls Handy Books, the Victorian-era recreational guides for children. Children must be accompanied by an adult. Admission: $6/adult, $5/senior (65+), $4/child (ages 4 -16), $2/child (2 and 3). FREE for children under age 2 and Friends members, with a current membership card. Fosterfields Living Historical Farm is located at 73 Kahdena Road, Morristown, NJ. For more information, visit www.morrisparks.net. Discover exactly WHERE, HOW, and WHY our nation's July 4th celebration got its start in Piscataway! Learn about Piscataway's exceptional history, see new and planned exhibits, and try a new smartphone app designed to give visitors a tour of the museum's extraordinary map exhibit, which illustrates the museum's theme: From Indian Trail to Interstate. The Metlar-Bodine House Museum, circa 1728, is listed on the National and NJ State Registers of Historic Sites and is the official historical and cultural museum of Piscataway Township. If you download now, additions will be available when new exhibits are mounted. Guided tours start on the hour and half hour. Pre-tour registration is necessary. Admission: $5 per person. The Dutch Door Gift Shop will be open. The museum is handicap accessible. Handicap parking is located in the lower parking lot. All parking is free. The Metlar-Bodine House Museum is located at 1281 River Road, Piscataway, NJ. 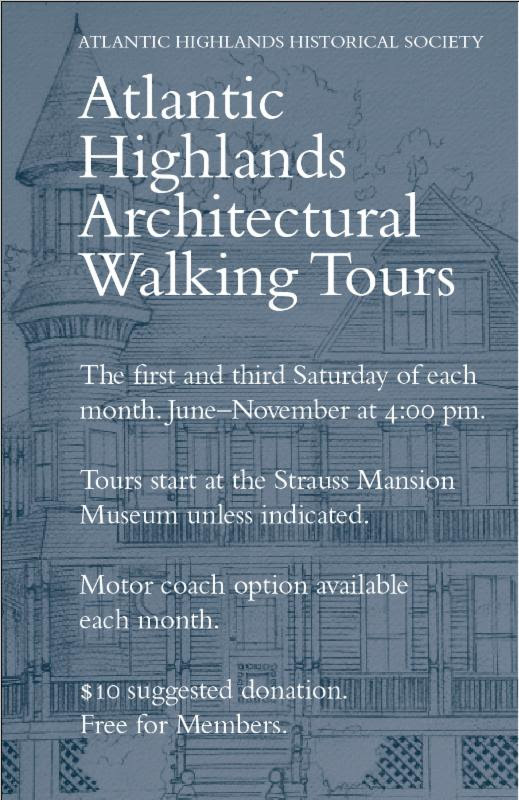 For more information and to register for tours, call 732-463-8363. For more information, visit www.metlarbodinehousemuseum.org. Oyez, Oyez Hear ye, Hear ye - The Friends of the Indian King Tavern Museum are proud to present Town Crier University from 1:00 - 3:00 pm on Saturday at the Indian King Tavern Museum. A town crier announces proclamations and news for their community. Learn about what town criers do and say! Learn about their uniforms. Children ages 10-16 are welcome to join us for this event. Pre-registration is requested. Please call the museum to register or for further information. The Indian King Tavern Museum is located at 233 Kings Highway East, Haddonfield, NJ. For more information, call 856-429-6792 or visit www.indiankingfriends.org. On Saturday, visit Historic Longstreet Farm in Holmdel to take a step back in time to see crafters demonstrate the art of penny rug making. This free event runs from 1:00 - 3:00 pm. Historic Longstreet Farm is located at 44 Longstreet Road, Holmdel, NJ. For more information, call 732-946-3758 or visit www.monmouthcountyparks.com. Come visit Waterloo Village between 10:00 am and 4:00 pm for a day in this historic Morris Canal town. Enjoy boat rides on the Morris Canal, Smith's Store - a furnished canal-era store with hands-on activities, blacksmithing, see the operating gristmill, seamstress shop, carpenter's shop, take guided tours of 1859 Methodist Church, the Canal Museum - with exhibits and videos, and guided walking tours of the village. Admission is free but there is a $5 per car parking fee. 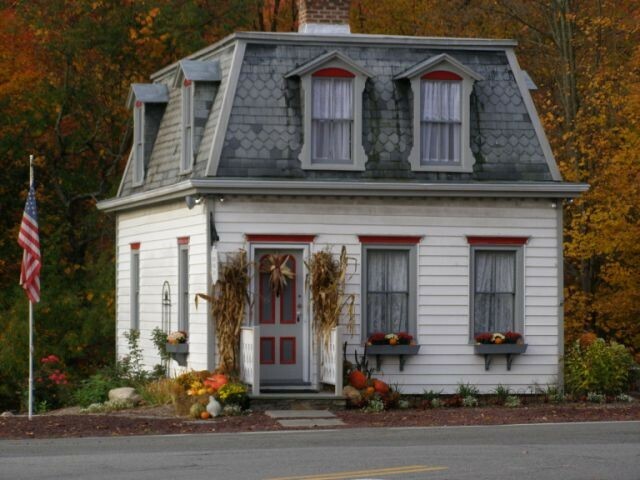 Waterloo Village is located at 525 Waterloo Road, Byram, NJ. For more information, call 973-292-2755 or visit www.canalsocietynj.org. Who would have thought that the Museum of Cape May County could be filled with a cadre of Caspers? For decades many people who toured the museum or worked in it have said the place is haunted. A team of paranormal investigators came to the museum with their equipment and see if the place really was "alive" with the sound of spirits. According to the investigators not only is it alive, the place is jumping. According to the ghost whisperers, not only does the museum have a ghost; it has a small village of them including children running across halls, a small child who tags along on every tour and a man who stays in the basement with his tools hammering away while mumbling about visitors who pass through. There's a group of men in the dining room who continue to discuss how they are going to get rich by selling off the land and there really is a party going on in the second floor Victorian music room. Even Lily, the woman who stands near the vintage Symphonian, is in a good mood. Right next door, however, in the colonial bedroom, a young mother paces back and forth while she looks out the window for the doctor. Her infant in the cradle has a high fever and she is afraid her baby will die before the doctor gets there. And the list of our other worldly visitors and their stories goes on and on. On Saturday, from 7:00 - 10:00 pm, the museum is hosting an adults-only Wine and Spirits Tour where you can travel through the rooms of the museum with investigators from Morningstar Paranormal and make contact with the resident "gentlepeople." The cost of the tour is $35 per person and includes a wine and cheese reception prior to the tour where members of Morningstar Paranormal Investigators will accompany you through the museum to meet our resident spirits. Due to limited space, reservations are strongly suggested. The Museum of Cape May County is located at 504 Route 9 North, Cape May Court House, NJ. For more information, call 609-465-3535 or visit www.cmcmuseum.org. Food can be art. During this talk from 2:00 - 4:00 pm, some of the most beautiful aspects of food are discussed. Admission: $7 per adult, $6 per senior, $5 per child age 4 - 16, FREE per child under age 4. Historic Speedwell is located at 333 Speedwell Avenue, Morristown. For more information, call 973-285-6550 or visit www.morrisparks.net. Experiencing the ring of an anvil, the roar of the forge and the sizzle of hot steel hitting cold water is just part of the fun in store for visitors to Howell Farm, when the blacksmiths fire up their forges. Throughout the day, visitors off all ages can help the blacksmith by turning the crank of his forge blower, adding coal to the fire, and carrying water needed for cooling hot steel. The smithies’ hooks, initialed horseshoes and other items will be for sale. In the barn, farm farriers will be shoeing the farm’s work horses and checking their feet. Experience history at Sandy Hook, part of Gateway National Recreation Area with a tour of two historic gun batteries. Tours at each site run continuously from 1:30 - 4:30 pm. Join a ranger guided tour of the Mortar Battery and learn about the battery designed to mount sixteen 12-inch caliber, breech loading, rifled mortars used for the turn-of-the-century coastal defense of New York Harbor. When construction began in 1897, Nine Gun Battery was originally intended to mount three 10-inch caliber disappearing guns. When construction was completed in 1902, an additional six 12-inch caliber disappearing guns were emplaced creating a nine gun battery that operated until 1944. Mortar Battery and Nine Gun Battery are located within historic Fort Hancock at Sandy Hook, part of Gateway National Recreation Area. For more information, call 718-354-4606 or visit www.nps.gov/gate. On Saturday and Sunday, visit Historic Longstreet Farm in Holmdel to learn how potatoes are grown and harvested. Help the Longstreet Farm staff bring in the crop, and dig some potatoes to take home for your own family. Stop by the summer kitchen for some 19th century inspiration on how to prepare them. This free event runs from 12:00 - 2:00 pm each day. Historic Longstreet Farm is located at 44 Longstreet Road, Holmdel, NJ. For more information, call 732-946-3758 or visit www.monmouthcountyparks.com. Experience life on an Early American farm through hands-on activities and exhibits at Historic Cold Spring Village's 'Down on the Farm' Weekend, Saturday and Sunday, from 10:00 am - 4:30 pm. Historic Cold Spring Village, an open-air living history museum, presents the trades, crafts, architecture and lifestyles of an Early American, rural South Jersey farming community. The Village is also home to a working 8-acre organic heritage farm complex. Special exhibits throughout the Village will include collections of antique and modern farming equipment and tools. Visitors can tour the historic Gandy Barn, c. 1880, which is now home to Levi the Village horse. In the morning, Levi and the Village farmers will demonstrate horse-driven farming techniques. Visitors interested in participating should wear closed-toe shoes. During the afternoon, visitors can take horse and carriage rides around the Village - free with admission! Guests can also visit the Village sheep, pigs, chickens and calf. The Family Activity Area will feature children's dress-up clothes, games, and take-home crafts. The Friends of Historic Cold Spring Village will also host the 5th Annual Dog Show on Saturday from 10:00 am - 12:00 pm. Registration for the Dog Show is $6 per pet and includes a treat, bandana, and free admission for one handler. Visit www.hcsv.org for more information and show rules. In celebration of the dog show, the Village is offering a $1 off "Dog Days of Summer" discount for all visitors at the gate! Historic Cold Spring Village is a nonprofit, open-air living history museum that portrays the daily life of a rural South Jersey community of the Early American period. It features 26 restored historic structures on a 30-acre site. From late June to early September, interpreters and artisans in period clothing preserve the trades, crafts and heritage of "the age of homespun." Fun and educational activities for children are featured Tuesday through Sunday, with special events every weekend through mid-September. Historic Cold Spring Village is located on Route 9, three miles north of Victorian Cape May and a mile and a half west of the southern terminus of the Garden State Parkway. Admission during the season is $12 for adults and $10 for children ages 3 to 12. Children under 3 are admitted free. Unlimited free admission is available with Village membership. The Village Nature Trail at Bradner's Run is open to the public for free self-guided tours. For more information, call 609-898-2300, ext. 10, or visit www.hcsv.org. The Brick Township Historical Society will sponsor its annual Civil War encampment on its Havens Homestead Museum on Saturday and Sunday. The 61st New York Volunteer Regiment will camp out in tents, and the public is invited to attend and share experiences with them. They will march and fire guns and show what chores had to be done during an encampment. Since they are there for the weekend, the hours are daytime on Saturday and until approximately 3:00 pm on Sunday. Admission is free; donations are appreciated. The Havens Homestead Museum is located at 521 Herbertsville Road, Brick, NJ. Parking is in a lot 150 feet east of the property accessed by a sign that says “Havens Farm.” For more information, call 732-785-2500 or visit www.bricktwphistoricalsociety.com. While taking a guided tour of this one-time top secret missile site at Sandy Hook (Gateway National Recreation Area), you will have the opportunity to meet and talk with some of the veterans who worked on the Cold War era Nike Air Defense System. Tours are free and available from 12:00 noon - 4:00 pm. Tours begin at Horseshoe Cove, Parking Lot L. For more information, call 718-354-4606 or visit www.nps.gov/gate. Celebrate the National Park Service's 100th birthday and climb the Sandy Hook Lighthouse with Keeper Samuel P. Jewell. Learn what it was like to be a lighthouse keeper during the 18th century. Any children climbing must be at least 48 inches to go up the tower. Tours from 12:00 noon - 5:00 pm. For your GPS, enter 85 Mercer Rd, Highlands, NJ 07732. For more information, call 718-354-4606 or visit www.nps.gov/gate. Edible History - Ice Cream! Learn a little of the history of this cooling summer time treat as you help us crank, and then consume, several ice cream flavors made from 19th century recipes. Can you imagine a better way to spend an hour on a summer afternoon? We’ll begin in the shade of the trees by the ice house at Historic Walnford. This is free historical family fun at at its best. Program lasts from 3:00 - 4:00 pm and is FREE! The Jefferson Township Museum, also known as the George Chamberlin House, will have an open house on Sunday from 1:00 - 4:00 pm. 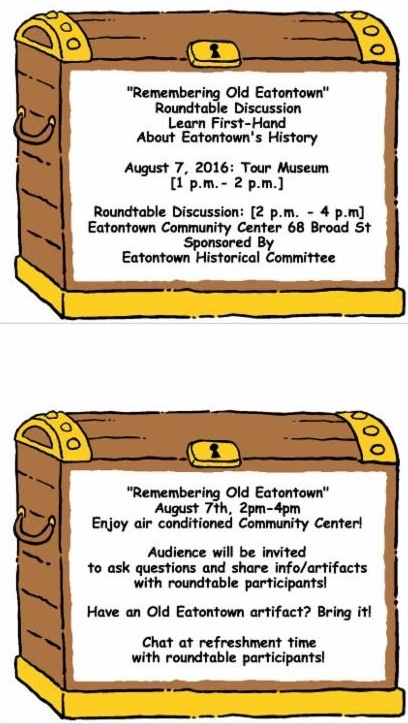 Learn about the Jefferson Township Historical Society. Costumed docents will be available to talk about this Victorian home. Admission is free. The Jefferson Township Museum is located at 315 Dover-Milton Road, Jefferson Township, NJ. Visit Miss Elizabeth's Shoppe located in the original kitchen of the museum, where small antiques, collectibles, handmade, handcrafted and seasonal items will be offered for sale. For further information, call 973-697-0258 or visit www.jthistoricalsociety.org. On Sunday at 5:00 pm in Lambert Castle, Annamaria Stefanelli and Rory Angelicola return to the Lambert Castle Concert Series and present An Afternoon of Italian Opera Plus. This musical program is filled with operatic favorites, including arias and duets from Puccini, Verdi, Mozart and other favorites. Admission to the concert is $15. Seating is limited - no reservations will be taken. This performance is a part of the 2016 Lambert Castle Concert Series. Featuring local musicians and a variety of musical genres, all concerts are performed in the beautiful atmosphere that is Lambert Castle. Lambert Castle is located at 3 Valley Road, Paterson NJ. For more information, call 973-247-0085 or visit www.lambertcastle.org. Stop by the South River Historical & Preservation Society on Sunday from 1:30 - 3:30 pm and view exhibits on all aspects of Borough history including: schools; churches and houses of worship; local businesses and organizations; daily life; events and celebrations; and more. While you are there, see the cemetery located behind the building, ask questions, drop off donations, or exchange hometown stories with the docents. The museum is located at 64-66 Main Street, South River. For more information, visit http://www.rootsweb.ancestry.com/~njsrhps/museum.html. On Saturday at Fosterfields Living Historical Farm, help the farmers wash lambs that were born in the spring. Program runs from 1:00 - 2:00 pm and 2:00 - 3:00 pm. On Sunday from 9:00 am - 2:00 pm, enjoy a pirate invasion and family activities at the base of the Cape May Lighthouse including pirate-hat making, characters, games, music and craft vendors. Free admission to activities on the grounds. The Cape May Lighthouse is located within Cape May Point State Park, 215 Light House Avenue, Cape May Point, NJ. Presented by the Mid-Atlantic Center for the Arts & Humanities (MAC). For more information, call 609-884-5404 or 800-275-4278 or visit www.capemaymac.org. 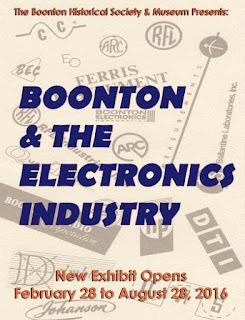 Our new changing exhibit features the numerous electronics companies that existed in Boonton during the infancy of electronics. Aircraft instrumentation, electronic testing instruments, and radios will be on display. 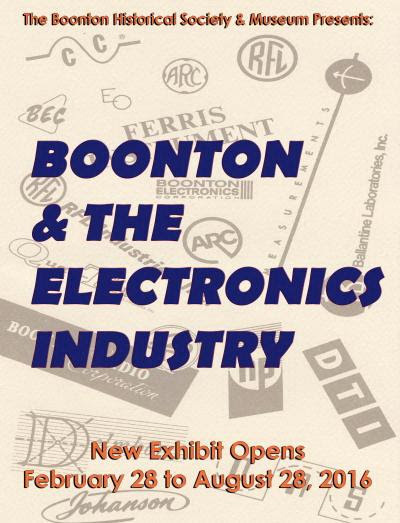 Learn more about Boonton's significant contributions to the electronics industry by visiting us at the historic Dr. John Taylor House in Boonton NJ. The site is open on Sunday from 12:00 noon - 4:00 pm. The museum is located at 210 Main Street, Boonton NJ. For more information, call 973-402-8840. Stop by the Cranbury Museum to view "Merchants of Main Street: A Stroll Through the Shoppes of Cranbury's Past," the Cranbury Museum's current exhibit which celebrates the creativity, hard work, and entrepreneurial skills of the Main Street merchants of the 18th, 19th, and 20th centuries. Main Street was filled with a diversity of businesses-general stores and candy stores, millinery and hat shops, blacksmith and harness shops, banks, and newspaper offices. Through the centuries, Main Street met the needs of the Cranbury shopper. Come take a stroll down Main Street, visit our merchants and view their wares and services. This exhibit will be displayed through August 2016 at Cranbury Museum, 4 Park Place East, Cranbury, NJ. The museum is open on Sundays from 1:00 - 4:00 pm. For more information, call 609-655-2611 or visit www.cranburyhistory.org. The reputation of the "New Jersey Tomato" may be legendary, but George Macculloch, the original resident and builder of what is today known as Macculloch Hall Historical Museum (MHHM), is credited with growing the first New Jersey tomato. Writing in his journal in 1829, in what is believed to be the earliest mention of the tomato, George Macculloch listed his cultivation of "tomatas." George's journal, a detailed record of his gardening successes and challenges, is a major highlight of the new exhibition at MHHM, Two Centuries of Cultivating Green Space: The History of Macculloch Hall's Gardens, which will be on view in the Schoolroom Galley of the Museum through September 1, 2016. This unique exhibition traces the history of the gardens established at 45 Macculloch Avenue by Louisa (1785-1863) and her husband, George Macculloch (1775-1858) in 1810. The Maccullochs were avid gardeners who cultivated their 26 acres for a variety of reasons: to feed their family, for profit, and as a form of creative expression. Through photographs, design plans, and the historic crop journal meticulously kept by George Macculloch from 1829-1856, this exhibition explores a variety of gardens at Macculloch Hall-from the early nineteenth-century kitchen garden and farm; to the later Victorian and early-twentieth century gardens favored by later generations of the Miller and Post families, to the mid-twentieth-century design created at the bequest of W. Parsons Todd by the Garden Club of Morristown. Two Centuries of Cultivating Green Space: The History of Macculloch Hall's Gardens also anticipates the interest of children in gardens and includes a special children's display focusing on the plants and animals often found in the backyard gardens of New Jersey residents. Through interactive displays such as a tabletop flower garden and a puppet tree, children can explore pollination and learn about the bees, butterflies, worms, and birds that help to make our gardens thrive. Children are also invited to participate free of charge in MHHM's summer garden program, Dig it! Plant it! Eat it! Programming for Two Centuries of Cultivating Green Space: The History of Macculloch Hall's Gardens includes special tours of the gardens, free with admission, Sundays in June, July, and August at 2:00p m.
The garden is open daily, free to the public from 9:00 am - 5:00 pm. MHHM is open Wednesdays, Thursdays, and Sundays from 1:00 - 4:00pm. Admission is $8, Adults; $6, Seniors and Students; $4, Children 6-12; and free for Members and children under 5. Macculloch Hall Historical Museum is located at 45 Macculloch Avenue, Morristown, NJ. For more information, call 973-538-2404 or visit www.maccullochhall.org. All Aboard! is an insightful look at how the railroad impacted on the development of the northern Barnegat Bay barrier island. A model railroad diorama of the Bay Head Railroad Loop, photographs, maps, videos, and railroad memorabilia will be on display. The museum is open to the public and a small donation is suggested for non-members. The Bay Head Historical Society and the Loveland Homestead Museum is located at the corner of Bridge and Bay Avenues at the Bay Head/Point Pleasant border. Summer hours: Friday through Monday from 1:00 - 4:00 pm. For more information, visit www.BayHeadHistoricalSociety.com. "Fine, Fancy, and Fashionable: 125 Years Dressing the Bride"
"Fine, Fancy, and Fashionable: 125 Years Dressing the Bride" offers an opportunity to experience the joy, magic, and elegance of 30 different wedding days and a visual timeline of bridal dresses from Mary Johnson Condit's 1840 silk gauze A-line gown to Alice Woodridge's 1954 lace tea-length dress. Join a bride and groom as they arrive at their reception in the dining room, a bride and her mother on the special day, and a busy bride creating her gown on an 1852 Florence sewing machine. Bridal accessories including shoes, gloves, veils, headpieces, photos, invitations, newspaper clippings, diary entries, and even a cake-topper, complete the display. The exhibit is on view through October 23, 2016. Acorn Hall is located at 68 Morris Avenue, Morristown, NJ. For more information, call 973-267-3465 or visit www.acornhall.org. Visitors to the USGA Museum in Far Hills will be surprised to learn that there is much to discover about the game of golf. Originally installed in February of 2014, the exhibit "More Than a Game" focuses on how the creation of African-American golf clubs positively impacted the community, despite the pervasive prejudice and racism of the Jim Crow era. They founded institutions that celebrated the game, and their culture, setting a new standard for what a free and open society could be. 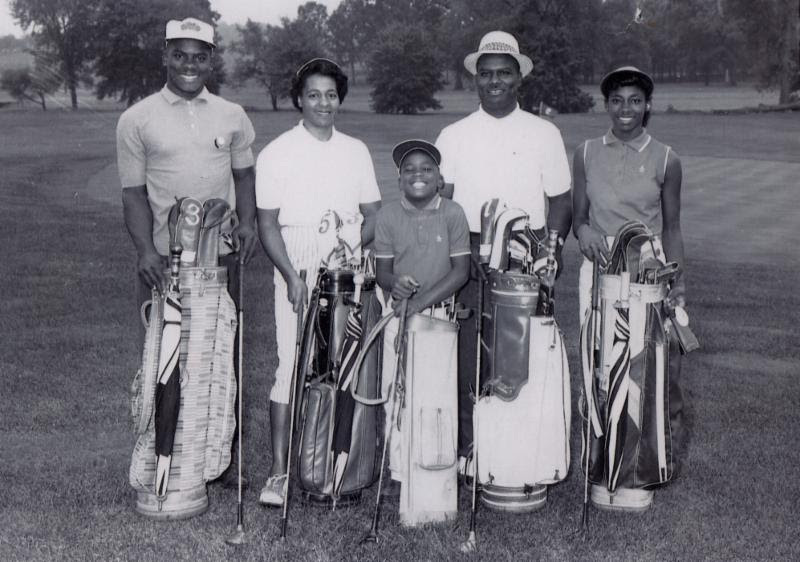 Local schools and youth groups are invited to arrange a field trip to the museum to learn about diversity in golf through the exhibit's centerpiece which is the story of William "Bill" Powell and the Clearview Golf Club. Founded in 1946 in East Canton, Ohio, Clearview is the only public golf course in the United States designed, built, owned, and operated by an African American. Celebrating their 70th anniversary this year, its existence is a testimonial to the vision, determination and integrity of Powell, who overcame numerous obstacles in the pursuit of his dream. Lesson plans are available upon request for teachers and group leaders prior to or following their onsite experience. Powell's Clearview Golf Club was not the only African-American golf institution founded in this era. The exhibit also honors other clubs that made significant contributions to minority golf including Shady Rest Country Club in Scotch Plains, NJ, home course of John Shippen, the first American and the first African American to play in a U.S. Open Championship in 1896. Also featured are significant trophies from the United Golfers Association and many other various artifacts that celebrate the men and women who made sacrifices in an effort to realize their dream of equality on the greens. The USGA is one of the world's foremost authorities on research, development and support of sustainable golf course management practices. It serves as a primary steward for the game's history and invests in the development of the game through the delivery of its services and its ongoing "For the Good of the Game" grants program. Additionally, the USGA's Course Rating and Handicap systems are used on six continents in more than 50 countries. For more information about the museum, this exhibit and field trip opportunities, please contact Kim Gianetti at 908-326-1948 or by email at kgianetti@usga.org. For more information about the USGA, visit www.usga.org.